This will probably not be at the front of your mind as you enjoy the Florida Key sunshine. 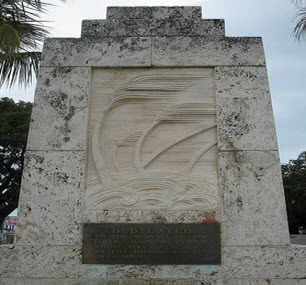 But as you are driving along the Overseas Highway keep an eye out for this monument down in Islamorada, whilst taking in the fantastic views on both sides. 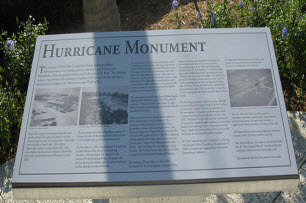 In fact it is highly likely you may have passed the Hurricane Monument on the island of Islamorada countless times, and not stopped to take a look at the 1935 Hurricane Memorial. The reason for the oversight, is quite simple. The Hurricane monument is a basic memorial carved out of local coral limestone, for many it doesn't look like much. But it is a memorial that for the residents of the Florida Keys is both eloquent and highly significant. 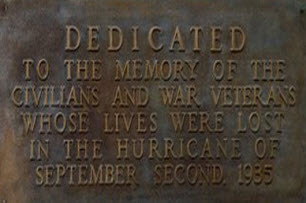 Since November 14, 1937 it has sat at the site between US 1 at mile marker 81.5, directly across from the library, and is there to remember all the people who tragically died in the terrible 1935 hurricane. It doesn’t really need to say any more than that, for the impact of its legacy to be felt. The 1935 Labor Day hurricane occurred during that years Atlantic hurricane season , and wasn’t just the strongest one of that year, but has been classified as one of the strongest to ever hit the United States of America. The 1935 hurricane was afforded the rating of a category five based on the Saffir–Simpson Hurricane Scale, and was the first of three Category five storms to hit America during the 20th Century. The others being around 30 years apart from each other in 1969 and 1992. It started as a very weak tropical storm around the Bahamas, but by the time it had moved Westward had grown stronger and stronger until on September the first begain reaching full hurricane status. By the next day, when arriving at the Florida Keys on September the 2nd it had arrived at its full deadly potential as a Category Five. And for the next two days it tore the coast of west Florida apart, until at last losing its power around Cedar Key on September 4th. By this time the loss of life was starting to be counted, and over 400 people were killed due to both the winds and the storm surge which reached a peak of nearly 20 feet in height. The problem that had occurred at the Keys, was although people knew that a storm was on its way there was at that time very little transport infrastructure to be able to cope with large scale evacuation. The main transport links bringing cargo to the Keys from the mainland Florida was restricted to one railroad line. This was run and maintained by the Florida East Coast Railway company, who had not considered the prospect of using the line for an emergency escape route. The Florida Overseas Railroad portion was used to send a train consisting of ten carriages down to get people out of the area, but upon reaching Upper Matecumbe Key was hit by the storm surge and the winds and knocked off the track. People had very little option than to get underground if they could, or pray. Tragically for 408 people their prayers could not be heard above the wind, and forever they will be linked to this small limestone memorial sitting on a small piece of ground in the island of Islamorada.